The improvement of productivity and efficiency of the maintenance function and the improvement of service delivery (less breakdown time) through the implementation of proper business procedures and workflow. 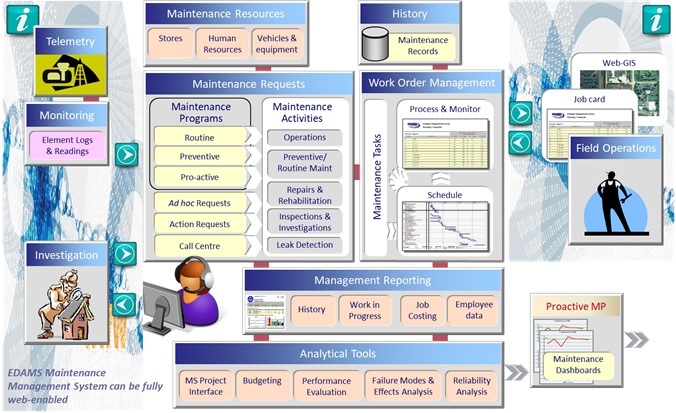 Maintenance Management: Includes (a) Recording and processing of maintenance requests, (b) Predefined industry-specific maintenance activities, (c) Allocation of maintenance resources, (d) Scheduling and management of resources for work orders (Stores, Support Services and Human Resources), (e) Work order management (including job card scheduling & processing), (f) Routine/ Preventive/ Proactive/ Reliability-driven maintenance programs, (g) Maintenance decision matrices, (h) Monitoring of networks, job costing, record keeping of history, generation of thematic maps and Maintenance Management reporting. Has industry-specific templates and procedures be able to handle all relevant Maintenance Activities such as: Investigations, Inspections, Operations (logs, meter reading, etc..), Operations Opening/ Closing of Valves, Installation of bulk (flow) meters, Leak detection, Repairs/ Outage management, Pipe/ other asset replacement, Servicing (Routine, Preventive Maintenance) relating to both Plants and Networks. Geographical display, selection of problem location and map printing for inspection. Reporting: Many standard Reports as well as allows the registration of new customized reports. The system can export scheduling to MS Project, create a budget per maintenance activity and compare with actual, report on Work in Progress for any action request at any given stage of execution, generate a Daily Operations Work Report and issue Network Fault Reports. The system keeps historical records of all activities and provides historical data analysis, generates Job Costing per activity, generates Crew/ Employee usage/ performance reports and Audit Trail Reports. Failure & Reliability Analysis as well as System Condition Assessment analysis using breakages records for specific elements is also enabled. Record a new problem or update an existing, preview various reports and in general, perform most of the maintenance operations as if in front of the desktop application.